Besides the daily work at a PC, there are many Alphacool employees who often enjoy playing a few rounds on the PC. For this reason, it only made sense to develop a mousepadthat is perfectly suited for working at the office and playing on the computer. The most important foundations were quickly established. Colourful pictures and multi-coloured abstract art will definitely not be present on its surface. It should appear elegant and simple, so the entire surface is matteblack. Only a small, discreet Alphacool logo indicates the manufacturer. Annoying obstacles that make working and playing difficult should not occur. 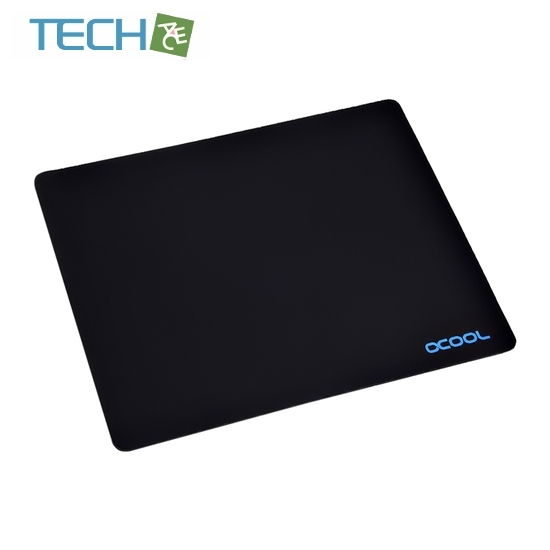 For this reason, Alphacool has placed a finely-structured cloth cover on the surface, whichshould create minimal friction resistance. The bottom of the "Eisteppich" is made entirely of rubber, so the mousepad slipping and sliding away is nearly impossible. With many mousepads, your hand has to rest on it for hours. That means your mousepad has to be comfortable. Under the cloth surface, there is a special thin foam whichhas a little give when pressure is applied. This means the mousepad is a comfortable surface for your hand to lie on for hours of work or play. This is also aided by themousepad's slight thickness, a mere 3mm. This means no annoying edges to get in the way. The "Eisteppich" is made of three very different materials. The full rubber bottom, a special foam layer in the middle and the robust cloth cover on thesurface. All the materials are bound together with a special heat treatment. This binding is so secure that Alphcaool does not need to sew the edges together to avoid theedges shifting. It is simply no longer necessary. All these points make the Alphacool "Eisteppich" the ideal pad for anyone looking for the perfect mousepad for work or play. Besides the daily work at a PC, there are many Alphacool employees who often enjoy playing a few rounds on the PC. For this reason, it only made sense to develop a mousepadthat is perfectly suited for working at the office and playing on the computer. The most important foundations were quickly established. Simplicity: Colourful pictures andmulti-coloured abstract art will definitely not be present on its surface. It should appear elegant and simple, so the entire surface is matte black. Only a small, discreetAlphacool logo indicates the manufacturer. Perfect Anti-Friction Properties and Slip-Proof: Annoying obstacles that make working and playing difficult should not occur. For this reason, Alphacool has placed a finely-structured cloth cover on the surface, which should create minimal friction resistance. The bottom of the "Eisteppich" is madeentirely of rubber, so the mousepad slipping and sliding away is nearly impossible. Comfortable Support: With many mousepads, your hand has to rest on it for hours. That meansyour mousepad has to be comfortable. Under the cloth surface, there is a special thin foam which has a little give when pressure is applied. This means the mousepad is acomfortable surface for your hand to lie on for hours of work or play. This is also aided by the mousepad's slight thickness, a mere 3mm. This means no annoying edges to getin the way.